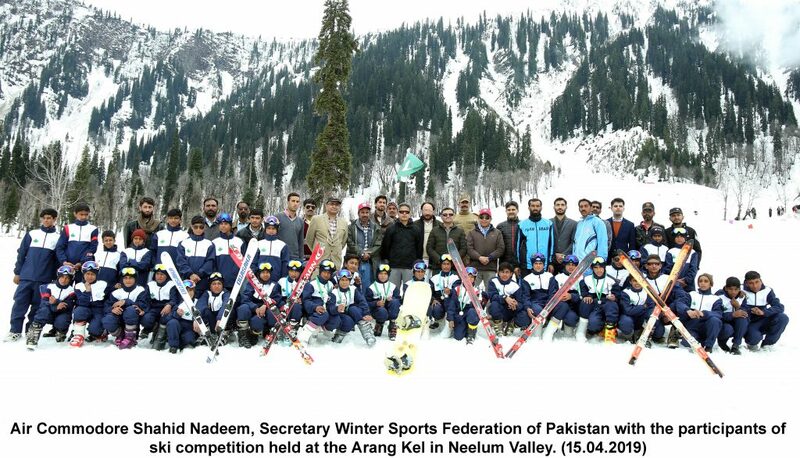 ISLAMABAD:WSFP – Winter Sports Federation of Pakistan in a press release stated that skiers from all over the country participated in the winter sports competitions during the Snow Sports Festival held at the enchanting Arang Kel in Neelum Valley. Elaborating the WSFP spokesman informed that Athletes of under 10, under 14 and under 16 years of age participated in Ski Competitions during the festival. Apart from Ski competitions the budding athletes also participated in snowboarding and ice skating events. A training camp for local youth was also organized by Azad Jammu & Kashmir Winter Sports Associations with the help of Winter Sports Federation of Pakistan (WSFP). WSFP not only provided technical support but also the equipment for these sports. Air Commodore Shahid Nadeem, Secretary Winter Sports Federation of Pakistan was the Chief Guest at this occasion. Brigade Commander Kel and President AJK Winter Sports Association were also present at the occasion. The Chief Guest, while addressing the ceremony, said that three athletes from Kashmir had participated in Sadia Khan Ski Cup held at Naltar in December, 2018, who performed very well despite having limited facilities available. He further said that WSFP was searching for more ski slopes in the snow covered peaks of Kashmir and KP to widen the spectrum of winter sports in the country. He added that to harness the potential of young players of this area the first youth ski training camp was also held in this valley earlier this month.